We provide the glasses, you provide the beverage of your choice. 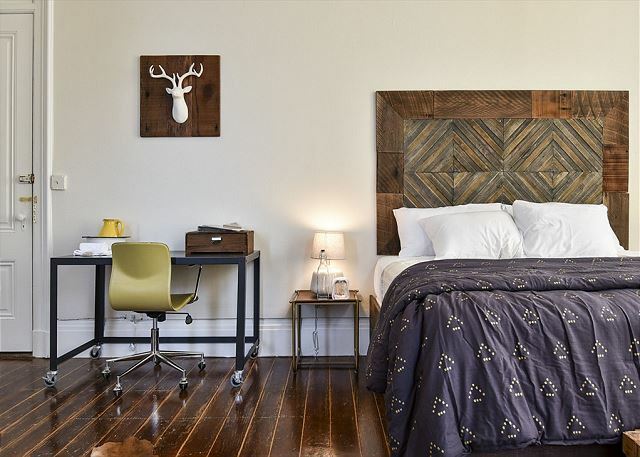 117 West is a boutique hotel room (SHARED BATH) on the second floor of the Victorian-era Buhne Building in the heart of Old Town Eureka, just two blocks from the waterfront and boardwalk. The Buhne Building is a mixed-use artisan community, with shops and galleries on the first floor and artist studios, hotel rooms and loft spaces on the upper floors. The walk to your room starts up a beautiful Victorian staircase and meanders around two dim hallways and ends, at your door, 117 West, next to an art studio. 117 West is light-filled, with floor to ceiling windows overlooking Old Town and Humboldt Bay. 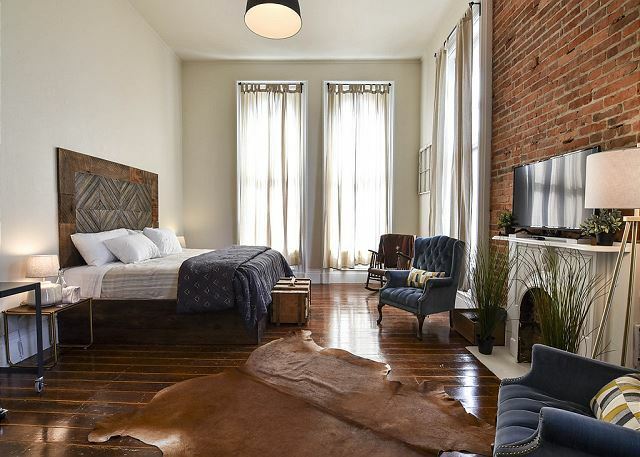 The original hardwood floors and exposed brick celebrate the room's history. The room is ideal for individuals or couples, and has a king-sized bed with pillow-top mattress. A microwave, mini-fridge, and tea kettle, and french press provide the comforts of a modern hotel room. The antique furnishings and spectacular views offer Old World charm. The bath is down the hall and up the stairs (yes, a hike) from your room and features a beautifully-tiled shower, antique sink and a modern dual-flush toilet. It is shared only with guests in the two other guest rooms in the building. Towels are provided for you in the room in a welcome basket. Old Town Eureka is a Historic district on the Redwood Coast containing buildings from the Victorian era, cobblestone streets, galleries, shops, restaurants, museums, and a waterfront boardwalk. Old Town Eureka is known as a fine arts mecca and for its monthly "Arts Alive" events (when local galleries stay open late and the streets are filled with music, food, and street performances). You'll find galleries, museums, artist studios, live music, and theaters within a few blocks. Old Town is also the perfect "home base" to explore Redwood National Park, Humboldt State Redwoods Park, area beaches and rivers. It is convenient to Arcata and Humboldt State University. Stunning architecture. Great communication and easy check-in. Looking forward to staying again. Wonderful to hear and we look forward to having you back again as well. Look us up at Redwood Coast Vacation Rentals when planning your next trip, with over 120+ properties, there is something for everyone, and thanks again for the review! This was a unique experience. We loved the room except for how cold it was, the little space heater wasn't really adequate. Thank you for leaving a review of 117 West! I'm sorry you found the room chilly, I will look into getting another heater in there. I love those gorgeous windows that flood the room with natural light. Please look us up again at Redwood Coast Vacation Rentals when planning your next trip to the North Coast, with over 120 vacation rentals, there's something for everyone! The room was great! Everything we wanted, but the shared bathroom upstairs was disgusting. We left the property to use the bathroom at a nearby business. Hi Beau,thank you for leaving a review of 117 West. I'm very shocked to hear you found the bathroom "disgusting". We clean the shared bathroom once a day, and I'm very sorry if it was left for you in a less than clean condition. I would request that in the future, please call your property manager so we can address the situation ASAP!! Again, very sorry that was your experience at the beautiful Buhne Building, and I will look into what happened, as we have a lot of guests coming through, and haven't received a bad review regarding the bathroom facilities that I can recall, so thanks for your feedback, it is really appreciated! This was an amazing room, beautifully furnished and cozy with 14ft tall ceilings. It's in the heart of the historic district with shops, restaurants, and art. This room has a view of the bay! I also love this room! Thank you for taking a moment to leave your review with us, we love getting feedback from our guests! Please look us up at Redwood Coast Vacation Rentals when returning to the North Coast, with over 100+ properties, there's something for everyone, in a lot of different areas. Thanks again! This is a great place to stay if you want to be downtown. The room was very clean and the shared bathroom was also clean and always available. Thank you for the feedback on 117 West. We'd love to have you back anytime, please look us up at Redwood Coast Vacation Rentals when planning your next trip to the North Coast! Thoroughly enjoyed the experience in 117 West! Really stylish and spacious room with great views. Wonderful to hear, I agree, the room is very beautiful, and if you love historic buildings, this is the spot for you! Please look us up at Redwood Coast Vacation Rentals when planning your next trip to the North Coast, with over 100+ properties, there is something for everyone! We stayed at 117 West for three nights. Everything is as described, and the bed is super comfortable. The property is about two blocks from the waterfront, and many wonderful restaurants are within walking distance. The decor is very hip, the room is huge, and I would recommend it to people who do not mind the shared bath situation. Currently the only shower is upstairs, but there is another bathroom on the apartment level. Thanks Allison for taking a moment to leave a review of 117 West. 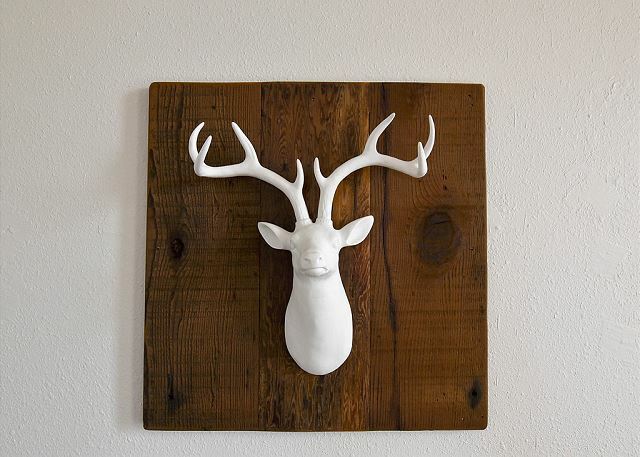 Located in the historic Buhne Building, this apartment has lots of beautiful details. The shared bathroom is one floor up from the apartment, and that's cleaned daily by staff. The bathroom on the same level is not serviced by us, so we cannot be held responsible for the cleanliness and so prefer guests to use the Shared Bath. Thanks again for leaving your review, we'd love to have you back anytime, please look us up at Redwood Coast Vacation Rentals when planning your next trip to the North Coast! We traveled from Seattle to Portland and then down the PCH to Eureka. We stayed in a variety of places over the course of our 8 day trip. This location was way out of our comfort zone, but we really enjoyed it. Thanks for leaving a review of 117 West, sounds like you enjoyed your stay in the historic Buhne Building. This room is really beautiful, we're glad you had the opportunity to stay with us and hope you will look us up at Redwood Coast Vacation Rentals when planning your next trip to the North Coast! The room is fantastic: spacious, bright, ultra-high ceilings, nicely decorated. Great view of the harbor. Good bed. Electric kettle and French Press provided. The shared bathroom is a minor inconvenience, since you have to climb some stairs to even get water for coffee. Thank you for leaving a review of 117 West. Being a historic building, there are some quirks that we can't change, but I will take your comments under advisement and see if there is a solution for filling the kettles. We really appreciate feedback, so we know what we can improve upon, so thanks again for your input! We had an amazing stay in the 117 West room. It was lovely, clean and had amazing view. The hosts were very easy to get in touch with and the instructions were easy. Sharing a bathroom was fine and the bed was sooo comfy. The location is perfect and we were able to walk everywhere we wanted. The building had so much history it was enchanting! Thank you so much for this review. It's kind of a Euro experience (Bathroom). We really appreciate you taking to the time to write this review and for staying with is at 117 West! The room itself was very nice. The shared bath was a bit inconvenient due to the walk upstairs but I never ran into anyone else or had to wait. Thank you for your review of 117 West Megan! It is a bit of a walk up to the second floor bathroom, there are two other units that occupy the same floor, California Cowboy, and European Flat that are less of a walk when you book in the future, which we hope you will! Thanks again for taking a moment to leave a rerview of your stay, and please look us up at Redwood Coast Vacation Rentals when planning your next stay! The views were lovely, it was convenient to Old Town, the room was just as presented in photos and the staff answered an evening call about a confusing couple of minutes with the electricity or power cords. I'll be back! The only other thing I'd mention is that it was difficult to heat the room with the space heater provided. So happy you enjoyed your stay at 117 West. We will take into consideration adding another heater for the space, however, it was a particularly cold spell we were experiencing during the time of your stay. The property manager is always on hand to assist you, and we would be happy to bring out an extra heater anytime should you find yourself in need! Thank you for your feedback, we look forward to your return! The room was charming, as was the building and neighbors. The bathroom was very private and clean. Room was a bit chilly, but there was a cold snap, and I am warm-blooded. The oyster bar downstairs is a little noisy in the evening, but quiets down promptly at the 9:00pm closing time. Refrigerator and french-press were nice. Check-out procedure was confusing: my reservation emails and the app did not say what to do with the keys (found instructions in the in-room book at last). Also, washing dishes prior to leaving is hard without dish soap and in a communal bathroom sink. Overall, a lovely place. Hi Angela, thanks for your review of your stay at 117 West. It really is a beautiful historic building. I'm sorry there was some confusion about where to leave the keys, in our reservation confirmation email, we leave instructions on where to leave the keys. Regarding the dishes, you are welcome to leave them for the cleaner to take care of, but thank you for being so conscientious about cleaning up after yourself! We have a portable heater we leave in-room, however, as you mentioned, it was very cold during your stay, and you can always call a property manager to bring back up! I'm so happy to hear you will be returning to 117 West, please let us know if you have any questions during your next stay, our number is in the in-room binder as well as on the app. Thanks again! Very unique. Looks just like the images and the building is a classic, beautiful Victorian. There is also some beautiful art in the hallways. The shared bathroom takes a little adjustment but was no problem. Only issue did not have to do with the rental itself but location being near The Pearl Lounge that gets rather loud on Friday and Saturday night. It was great to be able to just walk out into downtown old Eureka. If you like Victorian architecture and place to stay that is much more interesting than a hotel - consider this. Thanks for leaving a review of 117 West. Happy to hear you love the architecture as much as we do! We also think that it's a great alternative to staying in a hotel, much more character than most hotels in the area. The shared bath is cleaned daily and restocked. Sorry the noise carry over was a distraction to your stay, maybe we could incorporate ear plugs for guests who prefer a quiet night in bed on a Friday/Saturday night. Thanks for taking time to leave a review again, and we hope to have you back soon, visit us at Redwood Coast Vacation Rentals for all your vacation rental needs on the North Coast! Great modern high vaulted ceiling room conveniently located in downtown Eureka. We entered the room and were instantly surprised at how cool our room was! The only drawback was that it hasn't been cleaned since the prior occupant and we had to call the manager. Someone came within 20 minutes to strip the bed, mop the floor, etc. They were extremely apologetic and I think it was just an oversight. The shared bathroom was tidy, but sharing a bathroom for three nights was a bit much- one night is perfect. The inside of the building is beautiful. I'd recommend this place to stay for a night or two. It's a convenient place to stay and the rate is reasonable. Lisa, thank you for leaving a review fir 117 West! I'm so sorry that the room wasn't ready when you arrived, it was a communication breakdown and I was mortified that it wasn't ready when you arrived. Thank you for being so good natured and gracious about it. The shared bathroom is cleaned daily, but I could see how for a longer stay you'd like your own bathroom. I also think it's perfect for 1/2 nights for that reason. I sincerely hope you stay with us again at Redwood Coast Vacation Rentals. We offer over 100+ houses so there's something for everyone in regards to place and price. Thanks again for the review Lisa! I had a lovely stay in Eureka. The room is large and extremely comfortable. The location is perfect. I would come back in a heartbeat. Yay! We would love to have you back to 117 West. Thanks for staying an thanks for the review. We look forward to your return to 117 West with Redwood Coast Vacation Rentals, a 100+ accommodation company. 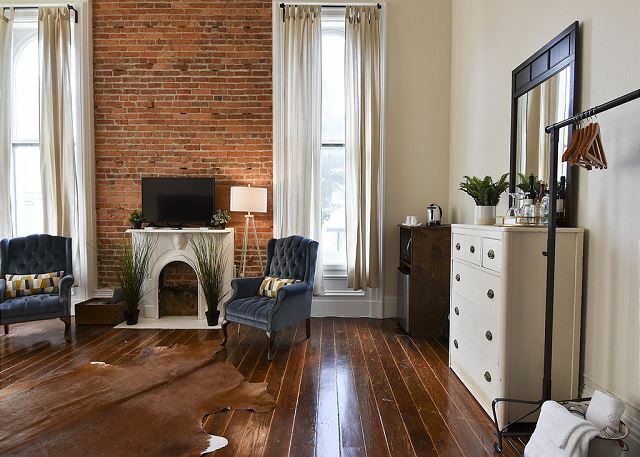 This room rental in an old circa 1884 building in old town Eureka was amazing. The natural materials, old hardwood stairs and floors brought so much character to the stay, and then you open the door from a multi-use building still under renovation and you relax when you see this room! Very well apportioned and such an eye for design. The bed was comfortable and with all the necessities to let this be an amazing base camp and respite for a week in the area! Truly great spot and I WILL be returning! Thanks so much Robert for taking the time to leave such a great review of 117 West! It is a wonderful room, with huge windows that allow tons of natural light, and the owners definitely had a vision for the decor. 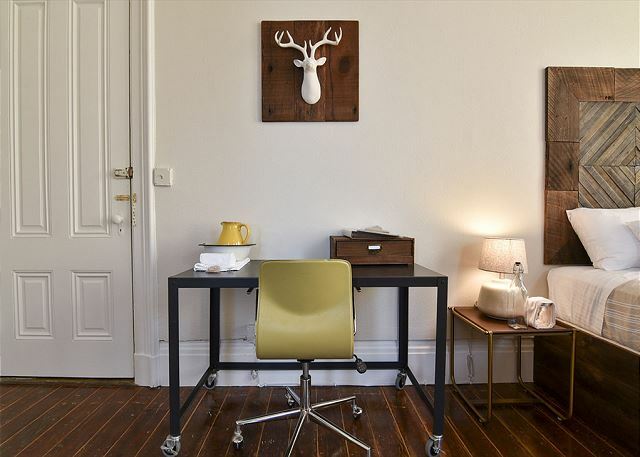 Lovely wood floors throughout, and the historic building all add to the charm. We are so happy to hear you'll be returning to stay with us again, Redwood Coast Vacation Rentals looks forward to seeing you again! The room is just as nice as it looks in the photos, and the location is perfect. Everything was laid out and welcoming, from the cookies to the coupons and the maps. It was a great place to use as a base while we explored the area. Thank you so much for staying with us at 117 West. We appreciate you taking the time to wrote this review and are so pleased to hear that you loved it! We look forward to your return. Great place to stay in Eureka! Beautiful room in the perfect location in Old Town. We only had to go downstairs to the Taste Local restaurant to try fresh oysters and the Lost Coast Brewery was right down the street. The shared bath was clean and spacious. Yay!! Thank you! We are so pleased to hear you loved this place, everyone seems to just love it. It's a really cool experience. We look forward to your return.